Quis ut Deus? Who is like unto God? This was the battle cry issued by Saint Michael the Archangel at the beginning of the first war in history, a war which will be fought until the end of time. That is, the struggle between the children of God and the children of the Lucifer, that old serpent. It is no surprise, then, that this glorious champion of God’s cause in heaven would be a suitable patron for those devoted to His most sacred cause on Earth. Devotion to Saint Michael flourished in the Middle Ages, particularly among the monastic orders as they viewed themselves as warriors of Christ. It follows naturally that these spiritual “special forces” in the combat for the salvation of souls would name their monasteries and shrines after Saint Michael the Archangel. 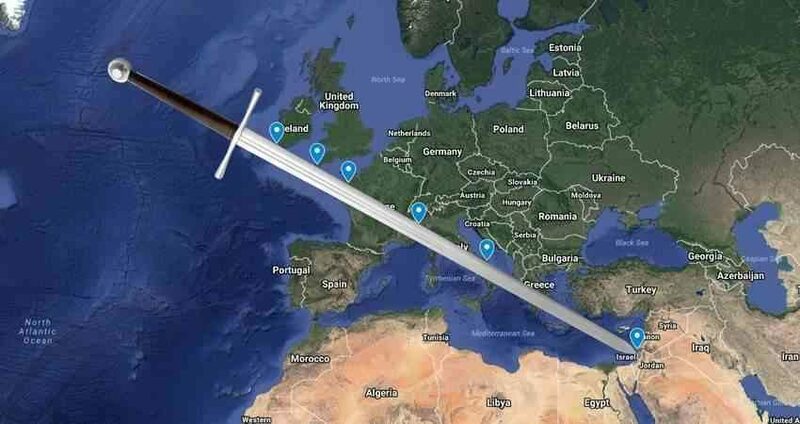 A great, yet largely unknown, sign of this devotion is the existence of a perfect ley-line, known as the Sword of St. Michael, which connects a line of monasteries from Ireland to the very heart of the faith, the Holy Land. Let us take a journey through these spiritual battlegrounds. The first shrine to Saint Michael is known as Skellig Michael, a craggy mountainous island off the West coast of Ireland. In the VI century, Saint Fionan occupied the island and founded a Celtic monastic community there. The monks lived in stone huts and were not only subject to the deprivations inherent to their ascetic life, but also the hardship of sustaining themselves given the difficulty of maintaining crops and herds in such a hostile environment. Despite harsh living conditions, the monks remained faithful. In return for their fidelity, God rewarded the small community with miracles. As Giraldus Cambrensis, a XII century Cambro-Norman Archdeacon in Wales, recounts, the wine used for the consecration in the Mass was constantly in full supply, despite the lack of grapes on the island. Another event that is certainly due to the work of Divine Providence was that after a hundred years of Viking raids – which resulted in the death of countless monks – a hermit of Skellig Michael baptized Olaf Trygvasson, the King of Norway, who in turn brought the multitude of his subjects out of the darkness of heathenism. 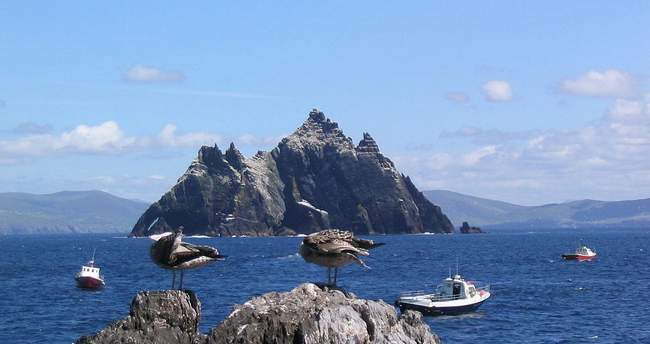 It is also said that Skellig Michael is the location where St. Patrick waged his final battle against the serpents, expelling them from Ireland forever. Next in line is Saint Michael’s Mount, the lesser known sister-site of the famous Mont-Saint-Michel in France. Like Mont-Saint-Michel, it is on an island accessible by foot only when the tide permits. 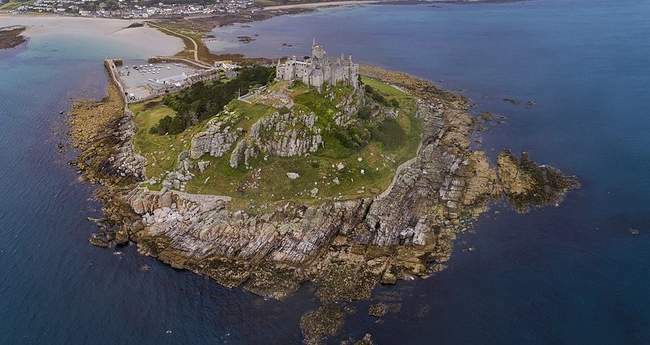 Interestingly enough, many of the religious structures on the island were built by the same monks of Mont-Saint-Michel who received the island as a gift from Saint Edward the Confessor, the King of England in the XI century. Long before it was occupied by any order, the island was a site of pilgrimage because of frequent apparitions of Saint Michael. According to sources from the Early Medieval period, the Archangel who is also the patron saint of fishermen, would guide nearby sailors to safety. Later, the property was seized by the crown and used as an outpost against the anti-Monarchist, anti-Catholic forces of Oliver Cromwell. Today, the site can still be visited, although much of the monastery has been assumed by secular buildings. Like its holy patron, Mont-Saint-Michel reflects the harmony and sacrality of the union of the religious and military spirit. Easily one of the most recognizable landmarks of Christendom, the abbey-fortress on the Norman coast of France traces its origins to the VIII century when St. Albert, bishop of Avranches, was instructed by Saint Michael in a series of visions to build an abbey on the island. Around that time, France was plagued by attacks from the Vikings. Because of this new pagan threat, the Franks placed themselves under the patronage of Saint Michael, their defender. Eventually, the Northmen – or Normans – settled down and converted to Catholicism. Naturally, their affinity with all things military brought them into the fold of St. Michael’s devotees. Under Abbot Hildebrand II, the plan for the structures of Mont-Saint-Michel that we recognize today began. Despite setbacks, the monumental project was finally completed in 1520. Unfortunately, the Congregation of St. Maur was forcibly removed from the shrine by French Revolutionaries, who turned the monastery into a political prison ironically named Mont Libre. The origins of this shrine to the Archangel are steeped in history. Roman Legions used the location as a base and later the Lombards occupied the strategic outpost. 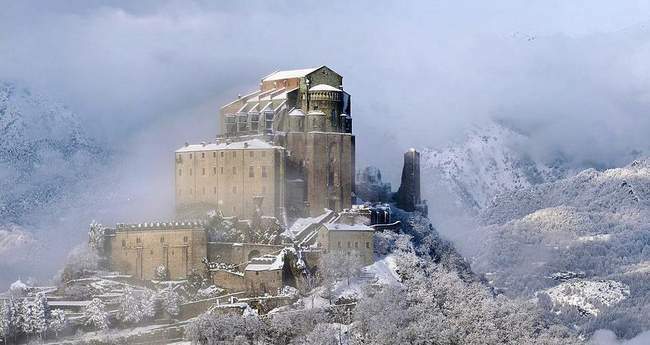 The Catholic history of the Sacra di San Michele begins in the X century, when Saint Giovanni Vincenzo, a hermit, was commanded by Saint Michael to build a shrine. Located on Mount Pirchiriano, the task before the Saint was practically impossible. By a miracle, however, all of the necessary building materials appeared precisely where the shrine stands today. Not surprisingly, the site quickly attracted pilgrims throughout Italy and beyond, including notable visitors such as Saint Anselm, Archbishop of Canterbury, whose nephew was a monk there. 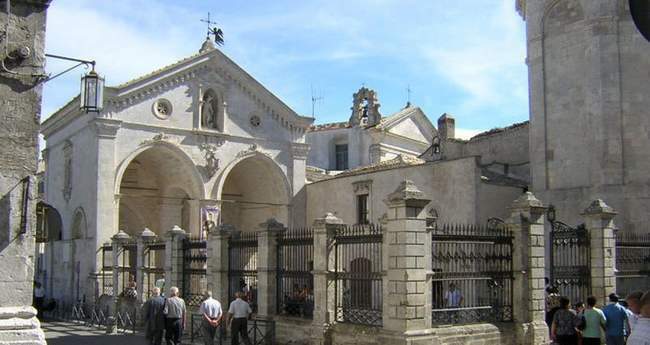 Like the other shrines, the Sanctuary of Monte Sant’Angelo sits high above the surrounding countryside. However, aside from being the oldest shrine of Saint Michael in Western Europe, it is unique because it was consecrated by the Archangel himself. In the V century, while Elvio Emanuele, 33rd commander of the armies of Siponto and local lord, grazed his large herd of cattle on the mountain, something unusual happened: His prized bull went missing. After a laborious search, Elvio finally found the bull at the mouth of a cave used for dark pagan practices. To get the bull to move, the nobleman fired an arrow towards the animal, but the missile bounced back. Startled, lord Elvio told the local bishop about the incident. The bishop, equally disturbed, prayed to heaven for guidance. After three days, Saint Michael appeared to the prelate and told him to build a place of Catholic worship at the cave. The bishop procrastinated. Another miracle associated with the shrine took place not long after when the local town was besieged by a large army. Despite the apparent hopeless situation, Saint Lorenzo beseeched Saint Michael for aid in battle. In turn, the Archangel appeared to him and assured him of victory. When the soldiers of the town met their attackers on the battlefield, lightning and thunder from heaven broke out. When the struggle ended, the enemy was destroyed. Following this extraordinary victory, Saint Lorenzo, by his own accord and at the behest of the Holy Father, went to consecrate the grotto to their celestial defender. Before he was able to do this, the Archangel announced to the bishop that there was no need to consecrate the site, for Saint Michael had already done so. In thanksgiving, Saint Lorenzo, seven other bishops, and multitudes of clergy and laymen processed to the sacred shrine. As they went, eagles shielded the bishops from the sun with outspread wings and when they arrived, they found a complete altar in place, along with a footprint of the angel. Saint Michael interceded again in the XVII century. At that time, there was a great plague ravaging southern Italy. The archbishop, Alfonso Puccinelli, realized the crisis was beyond a human solution and dedicated himself to prayer. Accompanied by an earthquake, the Archangel appeared to him in splendorous array. He instructed the archbishop to go to the grotto, gather stones, inscribe them with the initials MA (Michael Archangel) and bless them, and distribute them to the sick. The archbishop did as he was commanded and all who possessed the stones were delivered from the pestilence. The “tip” of the sword rests in the Holy Land, not in Jerusalem, but in Haifa, the site of the Stella Maris (Our Lady Star of the Sea) monastery on Mount Carmel. This is the same place where the prophet Elias resided, who, like St. Michael, wielded his sword against the enemies of God. Is it any surprise then that the spiritual children of this prophet, the Carmelites, live in the same spot as their father once did? The first Carmelite community on Mount Carmel dates back to the time of the Crusades, when European pilgrims decided to emulate the life of Saint Elias, who they considered to be the first monastic. But their desire to live in isolation and prayer was shattered by the conflict between the Christian West and the Islamic East. The Carmelites were driven out of the mountain by Saracens in 1291. 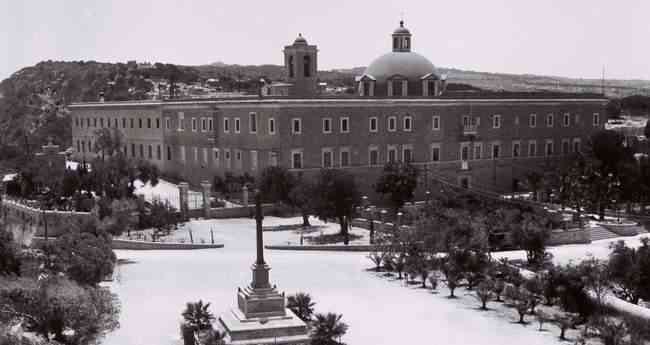 Four centuries later, the discalced branch of the order returned to Mount Carmel under the guidance of Venerable Fr. Prosper. Only 130 years after rebuilding their community, they were again expelled by Muslims who destroyed the monastery. Undeterred by their setbacks, the holy monks moved their location closer to the mountain cave of the Saint Elias, this time building over the ruins of a Byzantine chapel. In a subsequent conflict, Muslim forces massacred all the friars at the shrine, dismantled the monastery and used its stones to build an summer palace. The current monastery, a minor basilica, was built in 1836. Today it is still home to a Carmelite community. Zimmerman, Benedict. "The Carmelite Order." CATHOLIC ENCYCLOPEDIA: The Carmelite Order. Accessed September 26, 2017. http://www.newadvent.org/cathen/03354a.htm. "The myths and legends of St Michael's Mount in Cornwall." St Michael's Mount. Accessed September 26, 2017. https://www.stmichaelsmount.co.uk/explore-the-mount/history-legends. "ST MICHAEL'S MOUNT." , St. Michael's Mount - 1000654| Historic England. Accessed September 26, 2017. https://historicengland.org.uk/listing/the-list/list-entry/1000654. "Skellig Michael." Historical background. Accessed September 26, 2017. http://www.worldheritageireland.ie/skellig-michael/historical-background/. "Skellig Michael." Sacred Sites. Accessed September 26, 2017. https://sacredsites.com/europe/ireland/skellig_michael.html. "Sacra di San Michele." Wikipedia. September 16, 2017. Accessed September 26, 2017. https://en.wikipedia.org/wiki/Sacra_di_San_Michele. "Places associated with St Michael." HISTORIA VIVENS. Accessed September 26, 2017. http://www.historiavivens.eu/2/places_associated_with_st_michael_1111183.html. Huddleston, Gilbert. "Mont-St-Michel." 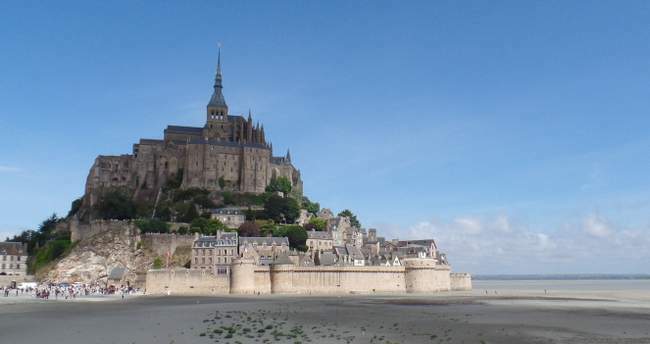 CATHOLIC ENCYCLOPEDIA: Mont-St-Michel. Accessed September 26, 2017. http://www.newadvent.org/cathen/10551a.htm. Carota, Father John. "St. Michael Archangel Apparition Monte Gargano May 8." Traditional Catholic Priest. May 08, 2015. Accessed September 26, 2017. http://www.traditionalcatholicpriest.com/2015/05/08/st-michael-archangel-apparition-monte-gargano-may-8/. Adams, Henry. "Mont Saint Michel." The Catholic Thing. June 25, 2017. Accessed September 26, 2017. https://www.thecatholicthing.org/2017/06/26/mont-saint-michel/. "A Brief History of The Carmelites." Official Website of the Carmelite Order. Accessed September 26, 2017. http://ocarm.org/en/content/ocarm/brief-history-carmelites.